Are Taurus woman Leo man a good match mentally, emotionally and sexually? The relationship between an earthy Taurus woman and a fiery Leo man can be smoldering in the bedroom but a smoky mess in reality. This male lion takes control while the female bull stands her ground. But if this king makes her feel like his queen, you will hear them roar! 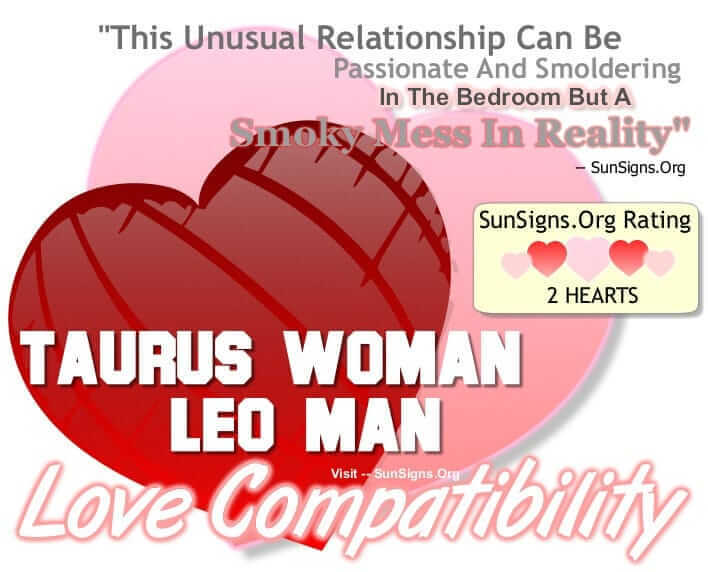 Learn more about the Taurus woman Leo man compatibility. Find out what is the best match for a Taurus woman. When the Taurus woman and Leo man are dating, they feel an instant attraction when they first meet. He is playful and flirtatious while she can hold her own in a conversation. He is always the life of the party and commands attention, and he shares his enthusiasm with everyone he meets. (Read more Taurus woman dating and dating a Leo man). Even though the Taurus female is more quiet and reserved, she shares his appreciation for the finer things in life. In a Taurus woman Leo man friendship, they will lavish each other with gifts and affection. It may be tough for her to accept his outgoing personality and constant need of the spotlight. This may cause some strain on the Taurus woman Leo man compatibility if not controlled in the beginning. But the Leo man in love is also a romantic who is committed to showing his gratitude toward her. The Leo male is very protective of his lover, and this supports her wish to feel secure in the Taurus woman and Leo man relationship. She is unable to resist his charming nature, and she offers him an alluring personality of her own. (As Venus is the ruling planet for the Taurus). This ignites the fireworks in the bedroom between these two star signs, as she is very sensual and he is extremely passionate. The Taurus woman sexually demands physical satisfaction, and he supplies it in spades. As king of the castle, he lifts her up to be his queen, which satisfies her need to feel safe in the partnership. The Leo man sexually reaffirms in words and actions that she is the most important thing to him. In bed, the Taurus woman and Leo man sexually challenge each other. They thrive on mental stimulation. It is safe to say there is love, mutual honesty, and respect between the Taurus woman and Leo man soulmates. He engages all of her senses and brings the two of them further down the road to ecstasy than she’s ever been. And while they may have some heated arguments, they are quickly resolved when things heat up in the bedroom in this Leo compatibility! Alas, not everything can be mended between the sheets for the Taurus woman Leo man love compatibility is not exactly too great. These two zodiac signs will have to emerge from their pleasure palace to resume their duties in the real world. While he is successful in his career, he also loves to spend his money and not always wisely. This drives his Taurus partner insane, for she too is successful and much more cautious with her finances. Unfortunately, caution is not a strong suit for Leo men, who enjoy living life to the fullest. This can be daunting for the Taurus woman, who would rather stay home then go out and party. Taurus women crave a stable home life and will do whatever it takes to make her house cozy and comfortable for this Taurus compatibility to survive. And her partner enjoys the fruits of her labor, especially when she goes out of her way to pamper him. But he must remember to show his appreciation for her efforts, or else he will see the female bull’s violent temper. Not even his quick tongue will talk him out of her stubborn standoff, and his dogged nature may leave things unfinished and lead to a Taurus woman Leo man breakup. (Know how to overcome a divorce). But if she trusts in his loyalty, she will be able to let him go and dance the night away while she enjoys the house to herself. And as long as he stays in with her once in a while, they can focus on the positive aspects of the Taurus woman Leo man marriage that keep things sizzling. Taurus is a fixed earth sign, and Leo is a fixed fire sign, the Taurus woman Leo man compatibility gets a TWO Hearts rating. This match between the Taurus woman and Leo man in love will only work when there is a reasonable understanding of the relationship. Otherwise, this relationship is doomed to failure! There is a chance of success if both put in some effort to make the match work.